Chibueze Onwunaka said his studies have helped him develop a holistic view of the interactions among the environment, the economy and society. 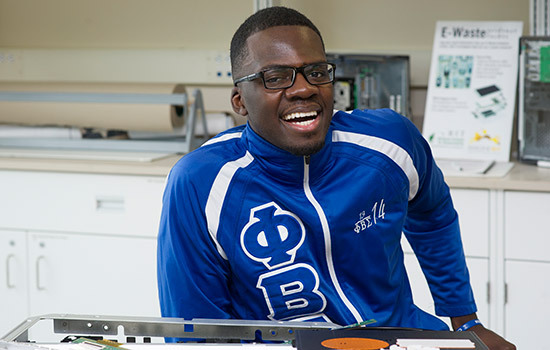 When you come across Chibueze Onwunaka inside the Golisano Institute for Sustainability (GIS) or elsewhere around the RIT campus, he often can be seen wearing a wide smile, a bright RIT-orange hat and joking gregariously with those around him. That wasn’t always the case for this affable graduate student in sustainable systems, affectionately known as “Chib” to his friends, classmates and professors. Coming with his family to New Jersey from his native Nigeria when he was only 5 years old, Onwunaka encountered intense bullying due to his accent and skin color. His early life in America was a stark contrast to the supportive and welcoming community he experienced back home. Onwunaka recalled becoming confused about why he was the frequent target of such cruelty. Despite such painful experiences, Onwunaka persevered and overcame such adversity, which today he believes helped him to discover his true path. After taking an AP environmental science class in high school, he became especially interested in wanting to improve the world’s environment, making it safer and cleaner for all. Onwunaka sought an environmental science program that would allow him to help and serve diverse communities of people. “I soon discovered that I was talking about sustainability,” he said. He said the graduate program in sustainable systems at GIS has enabled him to take a “holistic view” of what has become his life’s passion—how the environment, the economy and society can thrive when working together. The GIS program has motivated and inspired Onwunaka “to get better at all that I do so that I may serve diverse communities throughout the world,” he said. He’s currently developing an “intelligent waste bin” named “Smartie” that will sort trash and recyclables in one location, and he planned to demonstrate a prototype at Imagine RIT. Upon graduation in May, he wants to form a start-up company that will develop other innovative technologies that will help achieve a sustainable future for the planet. Someday Onwunaka also plans to return to Nigeria to foster educational initiatives that will help students there reach their full potential. His GIS professors have no doubt that he will succeed.